Video Uploader sample application shows how to upload movies, save them on the server, and show these movies in the gallery using a free Silverlight 2 Video Player. Keep in mind that this demo application is intended for demonstration purposes only. It is not recommended to use it in production. For real-life applications you should write your own code which takes into account its specifics. However, you can use this demo as starter kit that illustrates how to use Video Uploader in some typical situations. Feel free to copy and modify the code from this application. This demo application is implemented in ASP.NET C#. Display thumbnails in TwoPanes layout. Upload movies transcoded with user-specified settings. Upload 100x100 JPEG thumbnail for each uploaded movie. Redirect to the gallery page after successful upload. 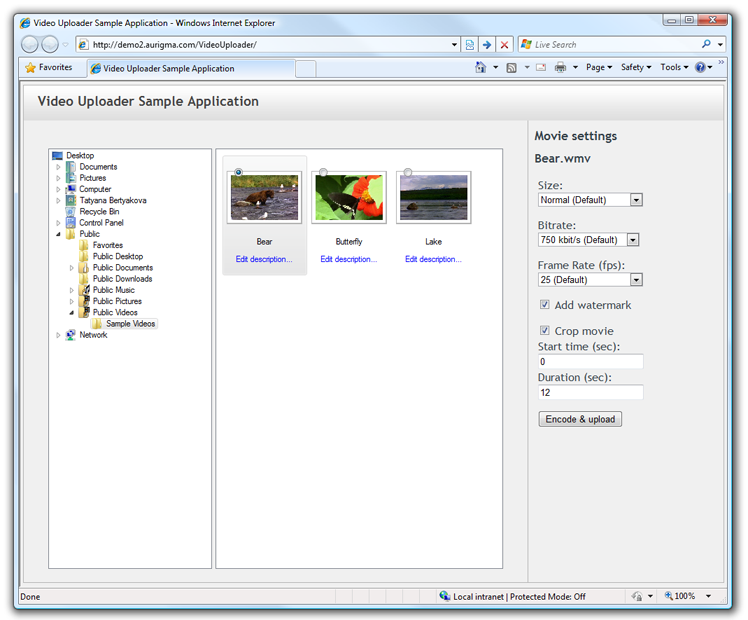 All Video Uploader features which are used in this demo application can be divided in the following groups. The central setting used every time Video Uploader initiates upload is the Action property. It specifies a URL to the page that receives data uploaded by Video Uploader (movies, thumbnails, and the other additional data). We will examine server code in detail below in this article. Another important (but optional) parameter is RedirectUrl. It specifies a URL where the user will be redirected to after upload is successfully completed. In our case it will be gallery page. This page allows users to look through the uploaded movies and playback them from the server directly. Although Video Uploader provides a big number of the appearance and behavior customization settings, in this demo only few of them are used. The most important of them is the PaneLayout property which specifies a layout of the control. In our case it will be TwoPanes layout, which is the easiest to use. All other appearance and behavior parameters have self-descriptive names, so it makes no sense to dwell on them. The code snippet below demonstrates how to configure default video transcoding settings. As Video Uploader is a pure client-side application, it can do only a half of the upload work - i.e. send files to the server. To receive files and carry out any additional operations, you should write your own code. Saves uploaded movies into the /VideoFiles/_GUID_ folder, where _GUID_ is the session unique identifier. Saves uploaded thumbnails into the /VideoFiles/_GUID_/Thumbnails folder, where _GUID_ is the session unique identifier. Creates an XML file that describes uploaded content (dimensions of the uploaded movie and its duration). In real-life application it is highly recommended to use database instead of XML files to store such kind of data. Get the movie and save it to the /VideoFiles/_GUID_ folder. Use the Movie1_N POST field, where N is an index of the file in the POST request. Get the thumbnail and save it to the /VideoFiles/_GUID_/Thumbnails folder. Use the Thumbnail1_N POST field, where N is an index of the file in the POST request. Write dimensions of the uploaded movie and its duration to the especially created XML file. Use the Movie1Width_N, Movie1Height_N, and Movie1Duration_N POST fields. The index of the file in the POST request (used in the Movie1_N and Thumbnail1_N fields) is one-based. It means that if the user uploads two files, they will get Movie1_1 and Movie1_2 fields (the same is true for others XXX_N fields). On Windows NT/2000/XP you should grant the modify permission to the Internet guest user (IUSR_<machinename>). On Windows 2003 Server you should grant the modify permission to the NETWORK SERVICE group. On Windows Vista and 2008 Server you should grant the modify permission to the account your site application pool is running under, Network Service by default. Keep in mind, this code just gives some guidelines how to integrate Video Uploader with your website. It is not presumed to be used in the production environment. For brevity reasons, it intentionally omits many handy things that you may want to have, e.g. email notification, saving to specific folder, user authentication, etc. This is matter of your application rather than of Video Uploader.